Florida on the cusp of the Second Seminole War. Map of Florida according to the Latest Authorities. Comparative Elevation of thePrincipal Mountas Cities & C. in North and South America. 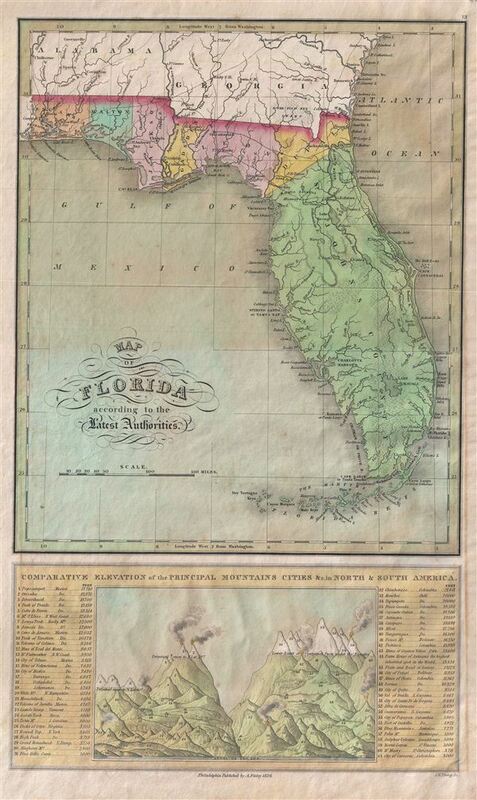 An extremely rare map of Florida issued by A. Finley in his 1826 New American Atlas. The map depicts territorial Florida just five years after the region was annexed by the United States. Color coding defines Florida's early county development with the north being divided into six counties while St. Johns County occupies the entire peninsular region. The map identifies Lake Mayaca – an early name for Lake Okeechobee following from the Mayaca People, an indigenous tribe occupying the upper St. John's River valley. Tampa Bay is identified both by this moniker and its earlier Spanish name, Spirito Santo. The 'Cape Florida Settlement,' a Bahamian immigrant village that would eventually evolve into Miami, is noted just west of Key Biscayne on the unnamed Miami River. Key West is identified as Thompson's Island. The island had been settled just four years previously with its main city, modern day Key West, being named Allentown in Honor Lieut. W. H. Allen, who died fighting pirates near the island in 1822. This map further details this region on the cusp of the bloody Second Seminole War. The United States acquired Florida from Spain via the 1821 Adams-Onis Treaty. Following the treaty wealthy planter immigrants were encouraged to move to the new territory, in theory developing the region. The consequent establishment of a slave owing plantation culture in Florida the effect of both encroaching on lands grated to the Seminole Nation by the Treaty of Moultrie Creek and increasing the number of runaway slaves seeking refuge with the Seminoles. The resulting conflicts lead to a series of bloody clashes that culminated in the Second Seminole War, 1834 -1842. The war ended ambiguously and this the say the Seminole nation has never surrendered to the United States. The lower quadrants of this map are dedicated to a comparative chart detailing the mountains of the western hemisphere. Such charts were common in early 19th century atlases and were intended to offer readers a sense of perspective regarding global elevations. The present chart is divided into two sections, with North American mountains appearing on the left and South American mountains on the right. The map identifies the Mexican volcano Popocatepetl as the highest mountain in North America at 17,710 feet and the great ecuadorian (then Colombian) mountain of Chimborazo as the highest mountain in the Americas at 21,441 feet. engraved by J. H. Young and published in Philadelphia by Anthony Finley. Dated and copyrighted 1826. This map is extremely rare, as are all maps from Finley's 1826 New American Atlas, and though well represented in institutional collections, rarely appears on the market. Finely, A. New American Atlas, (Philadelphia) 1826. Very good condition. Even overall toning. Blank on verso.